Now that I’ve been using a PIC32MX microcontroller for a while, and its associated software tools from Microchip, it’s time for a mini-review. My previous microcontroller experience was primarily with 8-bit Atmel AVRs, so my comments will reflect that. Many of the differences between a PIC32MX and AVR will also apply to any other modern 32-bit microcontroller, like the many ARM variants. On the whole, I’ve been fairly pleased with the PIC32MX. Below you’ll see that I’ve written much more about dislikes than likes, but that’s because the likes are largely self-explanatory, while the dislikes deserve a more detailed explanation. Note: Last year Microchip purchased Atmel, the makers of the AVR. So now both of the microcontrollers in my comparison are provided by the same company. Faster core speeds – Up to 50 MHz on my PIC32MX230F256, 80 MHz on other devices in this family. Clock PLL – Synthesize core speeds anywhere from 1 MHz to 50 MHz from a fixed-speed external crystal or internal RC oscillator. More flash memory – 256KB seems like a lot. Configurable pin remapping – Relocate functions like the UART’s TXD and RXD to one of several different possible physical pin locations. Makes PCB routing much easier. Set / clear / invert registers – Modify a single GPIO pin with a single instruction, without needing to do a read-modify-write of an entire port. DMA – I haven’t used it yet, but this will enable possibilities like writing a long piece of text to the serial port while the program continues on to do other things. IDE – The Microchip MPLAB X IDE seems pretty good, after you install the separate PLIB libraries that are required for compiling all the example code. Debugger – With the el-cheapo PICKit 3 programming tool, you get a halfway decent debugger in MPLAB X. I can’t believe I survived for years on the AVR with no debugger at all. Bloaty code – A similar amount of code seems to consume substantially more program flash memory on the PIC32MX than the AVR, so the larger amount of flash on the device isn’t as much of an advantage as it first seems. Part of this is due to the hardware difference between 8-bit and 32-bit instructions, and part due to compiler optimizations to software (see below). Awkward bootloader setup – The PIC32MX230F256 has 3KB of protected boot flash, which isn’t enough to do anything useful, considering how bloaty the code is, and that more than 1KB will be consumed by interrupt vector tables and the C startup code. My USB mass storage device bootloader is 39KB of code! This forces the bootloader to be located in main program flash, which requires using a customized linker script for the main program to map everything to new memory locations, which requires that the bootloaded and non-bootloaded versions of the main program are subtly different. 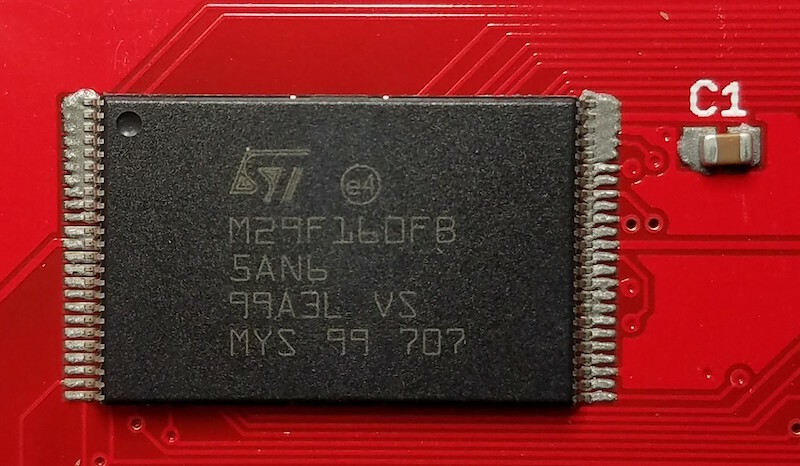 No EEPROM – AVR has separate non-volatile EEPROM memory for storing user preference data, that can be updated one byte at a time, and is rated for 100K erase cycles. PIC32MX has no equivalent. You can reuse some of the program flash memory for the same purpose, but it can only be updated one page at a time (1K or 4K depending on the device) and is rated for 10K erase cycles. Fewer instructions per clock cycle – AVR executes one instruction per clock cycle, so 16 MHz means 16 MIPS. The number of instructions per clock cycle for PIC32MX varies, but will on average be less than one, due to flash memory wait states, addressing modes, pipeline stalls, and other factors. So while the core speed of PIC32MX might be 3x faster than AVR, it won’t necessarily run code 3x faster. Debugger limitations – When using the PICKit 3, the debugger can’t view arbitrary memory or array elements, can’t set new breakpoints while the program is already running, can’t step through a disassembled view of arbitrary code (without a map file), and is incredibly slow for single-stepping through code. I’m not sure if these are software issues, or limitations of the PICKit 3. Microchip offers other more expensive debugging tools that may address these issues. Limited compiler optimizations – The XC32 compiler that’s included with MPLAB X will compile your code with -O0 (no optimization) or -O1 (some optimization for speed and size). But it won’t do -O2 (more optimization for speed) or -Os (optimize for size). It also won’t do a bunch of related linker optimizations to help reduce code size. Those require the pro version of the compiler, which is a $30/month subscription. Mixed quality libraries and code examples – Almost all the PIC example code you’ll find on the web, from Microchip or 3rd parties, uses the PLIB peripheral library along with MLA (Microchip libraries for applications). A few years ago these were officially discontinued in favor of a newer solution called Harmony, but the developer community has largely ignored Harmony and continued using PLIB and MLA. The strong impression I had was that attempting to use Harmony would make life unnecessarily difficult. Yet some of Microchip’s newer code examples are only available in Harmony versions, while older examples are only PLIB/MLA versions, resulting in a confusing mess. Many of the PIC32MX code examples I found were designed for the top of the line, the PIC32MX795. These examples are mostly applicable to the PIC32MX2xx family too, but sometimes there are subtle differences that are difficult to catch. 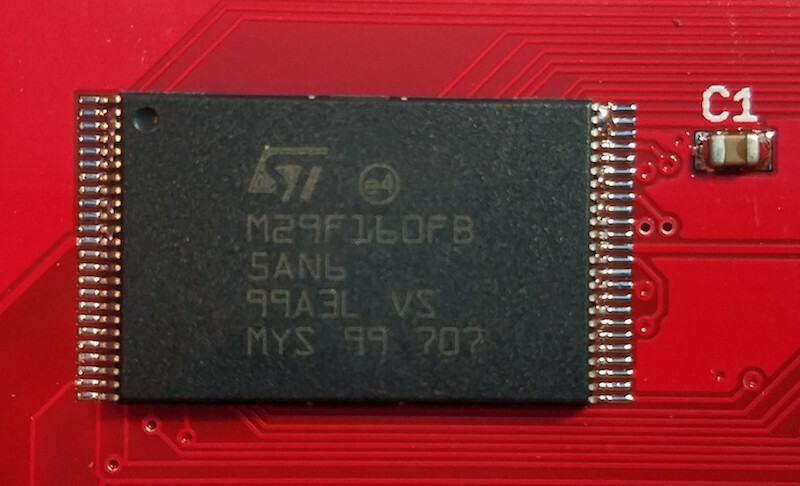 For example, Microchip’s PIC32 USB mass storage bootloader example assumed the device had a flash erase page size of 4K, with a comment in the code that said “do not change this value”. 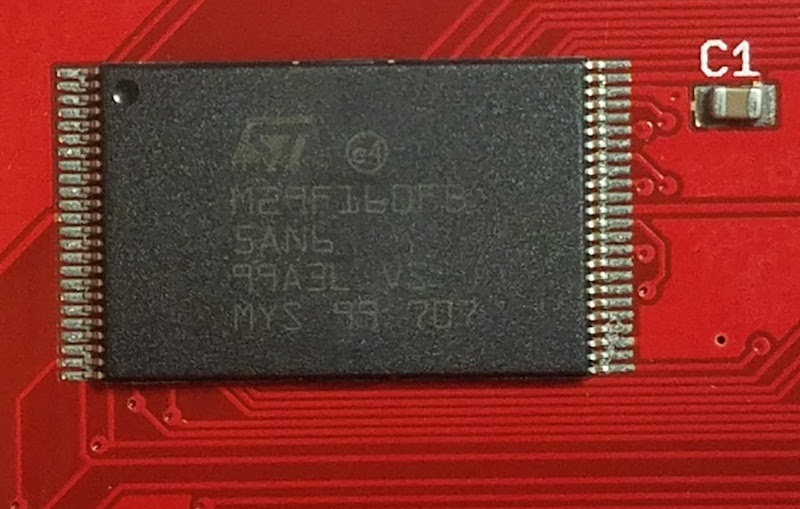 Only after much frustration did I discover why it wasn’t working reliably – the PIC32MX2xx has a 1K flash erase page, so the Microchip code was only erasing 1/4 of the the flash memory during bootloading. This was my 6th *@#&% attempt to assemble some ROM-inator II PCBs using reflow soldering, instead of my normal drag-soldering with an iron. I may not be too bright, but at least I’m persistent. 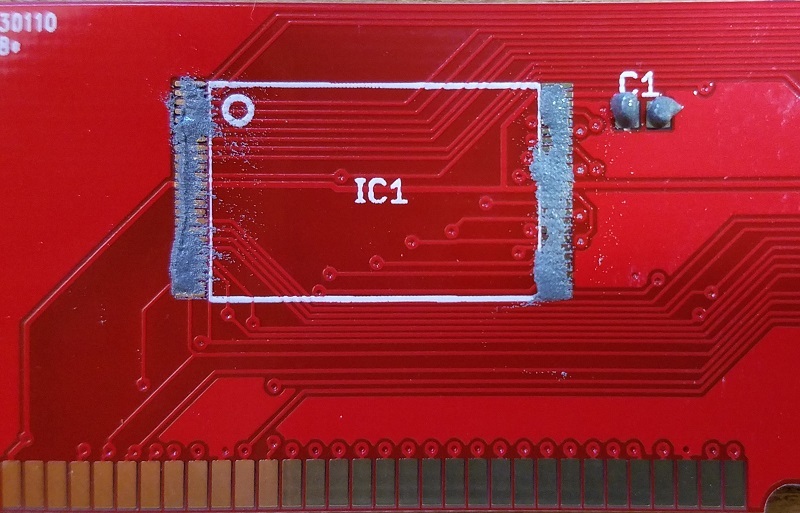 All of the previous attempts failed in slightly different ways, resulting in boards with multiple solder bridges that needed to be cleaned up manually with an iron. This time I altered the way I created a frame for the board being reflowed, and it almost worked. It was certainly the best result so far, but still not good enough. 1. 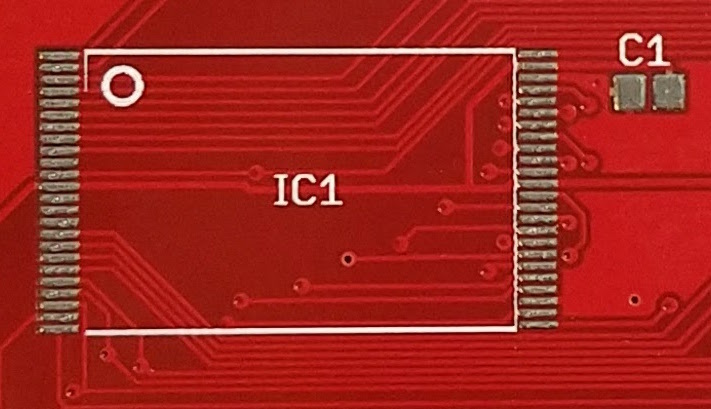 The ROM-inator II PCB has two chips with 0.5mm pin spacing, which is very small. If my boards had larger components with more forgiving pin spacing, my earlier attempts would probably have gone much better. 0.5mm might be approaching the limit of what can be done at home without special equipment. 2. I need the PCB to be 100% perfect after reflow, with no manual touch-ups required to fix solder bridges. If this were a one-off prototype, a few solder bridges would be no big deal. But since my goal is to develop a new process that’s faster than hand-soldering, I can’t afford the time needed to do manual touch-ups after reflow. 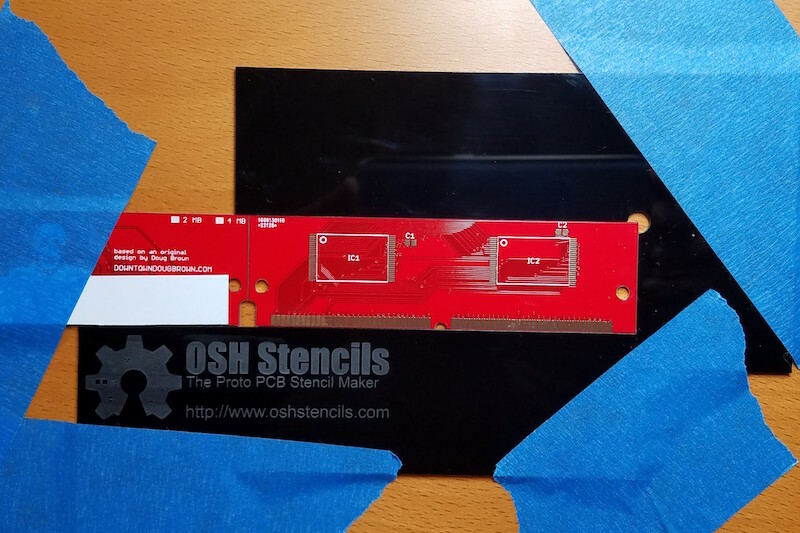 I discovered that I needed to wipe both sides of the stencil clean after each use, otherwise the solder paste application grew progressively messier with each new PCB. I also found that I wasted a lot of solder paste. Dispensing the minimum possible amount from my syringe was still too much, and resulted in a lot of leftover paste on my plastic scraping tool. It was hard to reuse the paste stuck to the scraper. When I tried it a couple of times, using another scraper to clean off the first scraper, the results weren’t good. Is this the end of my reflow soldering saga? I think so, at least for this particular PCB. I don’t think I can improve further on these results without more effort than can be justified, yet the speed and quality of the process isn’t good enough to replace my current method of drag-soldering with an iron. I’ll revisit this again the next time I have a new PCB to assemble, and I’ll try to stay away from 0.5 mm pitch parts in my designs. This was my 5th attempt to assemble some ROM-inator II boards using reflow soldering, instead of my normal drag-soldering with an iron. After various failures in the previous attempts, this time I used a stainless steel stencil to apply solder paste to the pads, hoping the stencil was the missing ingredient needed for success. I’ll save you the suspense: it didn’t work any better than my earlier efforts. I think I’m cursed. 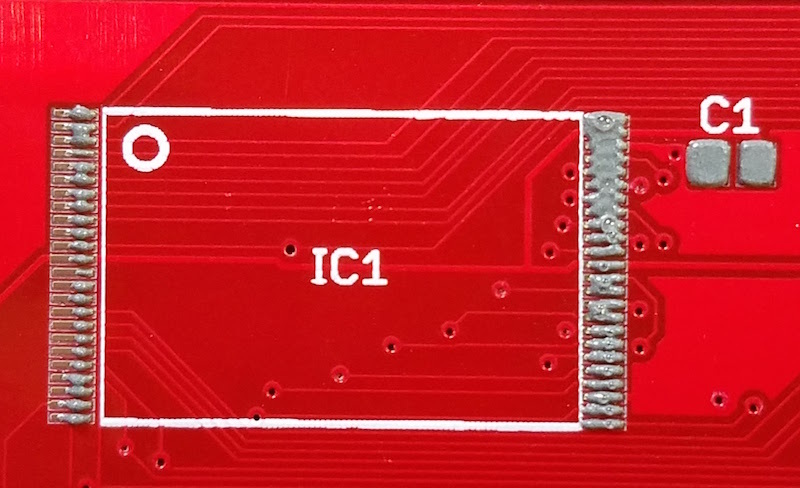 The ROM-inator II PCB has two chips with 0.5mm pin spacing, which makes home reflow particularly challenging. If my boards only had larger components, SOICs, and the like, my attempts would probably have gone much better. With the 0.5mm chips, no matter what method I tried, I ended up with numerous solder bridges between adjacent pins. I was able to fix up the solder bridges manually with an iron, so all the boards worked in the end, but reflow totally failed as a faster and easier replacement for drag-soldering. For that, I’d need boards to come out of reflow with zero solder bridges at least 80-90% of the time, and I was never anywhere close to that level of success. I ordered a 4 mil stainless steel stencil from OSH Stencils, and paid a little over $20 for the stencil and a couple of acrylic framing pieces. Ordering was easy, but I did run into a a few problems with my paste layer generated by EAGLE. The paste layer also contained my board outline, which I clearly didn’t want cut into the stencil. It also contained openings for all the edge contact pads on the PCB, which are not meant to be soldered. It required some extended futzing around in EAGLE in order to suppress the unwanted outline and pads, and generate a new paste file. I taped the acrylic framing pieces to my desk, along with an extra blank PCB, to create a secure frame. Next, I placed a ROM-inator II PCB in the frame, and taped the stencil over it. Aligning the stencil correctly with the pads underneath was easier than I expected, even for the sub-millimeter sized pads. 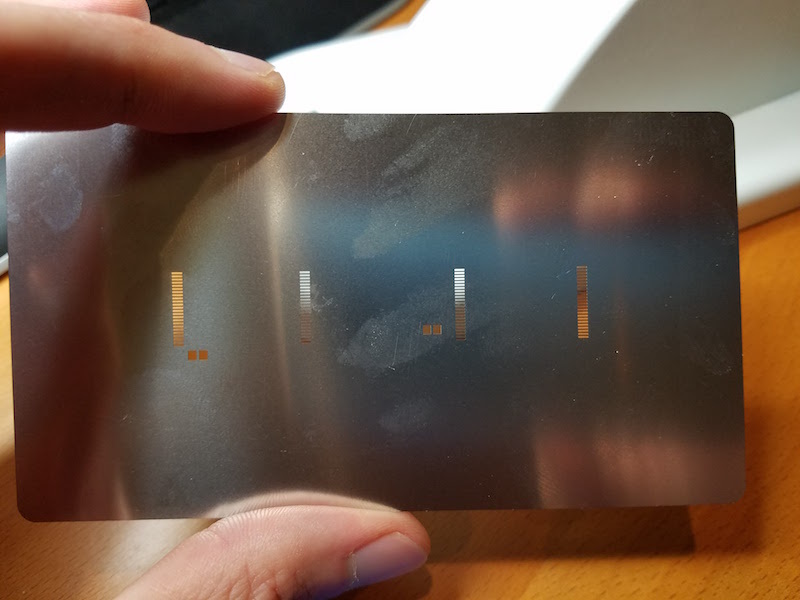 I then squirted some solder paste from a syringe onto the stencil, and used a plastic card to scrape the paste across the stencil, filling the holes. Scraping the paste into the stencil openings was more difficult than I’d expected. I’d thought I would be able to make a single pass and fill all the holes, but some holes only partially filled with paste, even when there was plenty of paste scraped over them. Something to do with the thickness of the stencil, the size of the openings, or the viscosity of paste maybe? I had to make repeated passes from different directions with the plastic scraper before all the stencil openings were filled evenly. One problem I hadn’t anticipated was the thickness of the acrylic framing pieces. They’re about 1.5mm thick, but the ROM-inator II PCB is only 1.2mm thick, resulting in the stencil floating 0.3mm above the PCB. 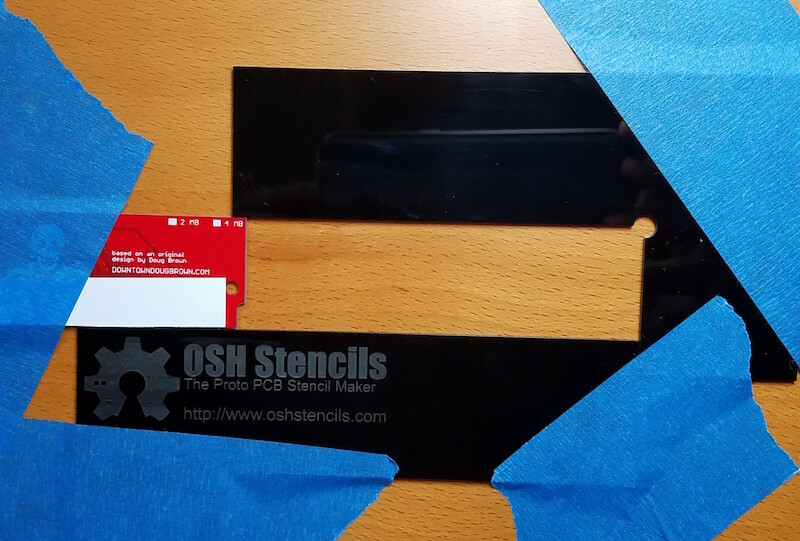 0.3mm may not sound like a lot, but it’s about 3x the thickness of stencil. In practice, the stencil flexed enough that it mostly sat flush on top of the PCB, but it clearly wasn’t ideal. The final photo above shows the mixed results of solder paste application. For larger things like the C1 capacitor, it was great. 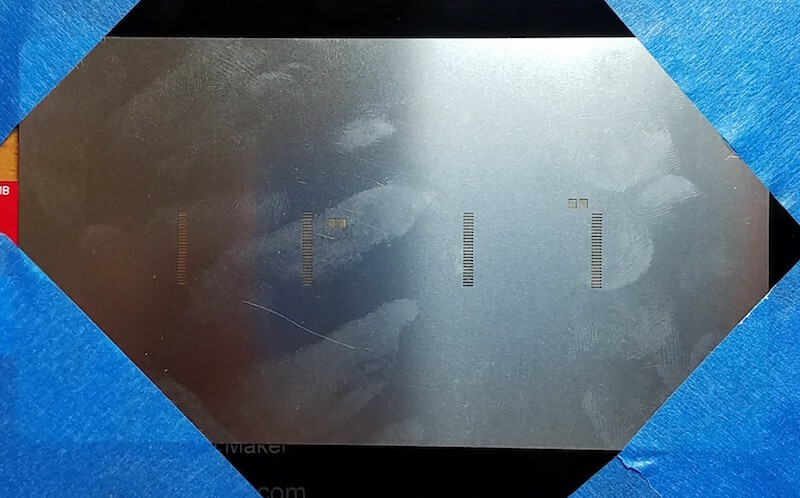 And for many of the individual pads on chip IC1, there was a nice clear line of paste right on the pad. But for many other pads, the solder paste was smeared between several adjacent pads. Not good. 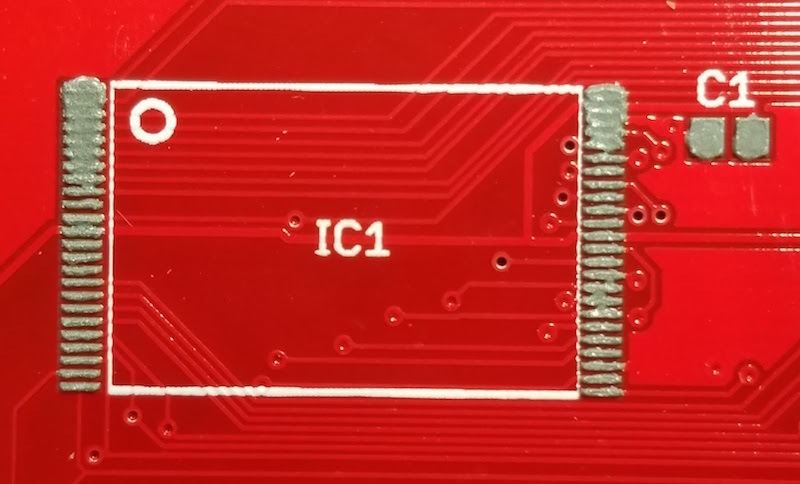 I tried a second PCB, this time attempting to use less solder paste overall, but the results were the same. Then I tried a third PCB, and scraped the solder paste across the stencil left-to-right, parallel to the orientation of the pads, instead of perpendicular. That resulted in some weirdly uneven application, and more of the same solder bridges after reflow. I could never get the solder paste application to come out cleanly, and it always seemed like too much. At this point I’ve run out of blank ROM-inator II PCBs, so my experiments will have to stop for a while. I hate to end a series on a down note, but I’m a little frustrated and disappointed with this whole effort. Maybe I would get better results with thinner frame pieces, or a toaster oven instead of a hot plate, or yet another brand of solder paste, or a different paste applicator, or more flux, or a pick-and-place, or… but at some point I have to admit this just isn’t working. Once I get more blank PCBs to play with, I’ll consider whether to try further experiments. After four semi-failed attempts, I am not destined for success with reflow soldering using an electric hotplate. At least not with chips having a 0.5 mm pin spacing. At this point I’m only motivated to continue on by pure stubbornness, as any hope that this would “save me time” is long gone. Building on the results of my most recent previous attempt, I tried again with a new aluminum plate and new solder paste. I was pinning my hopes on the new solder paste, after having discovered that my original solder paste syringe had already expired by the time I bought it. I suspected that the poor wetting behavior and large number of solder bridges were due to spoiled paste. Judging by its date code, the new solder paste was only five months old, and before purchase it was stored refrigerated by DigiKey to prevent spoilage. They shipped it in a cold pack, at least, so I assume it was refrigerated before that. The results were sadly the same as my prior attempts: poor wetting and tons of solder bridges. Apparently it wasn’t my solder paste’s fault, but my technique. The video shows the story in all its gory detail. Looking at this photo now, the solder paste coating is kind of terrible, but at the time it seemed good. It’s hard to appreciate just how small those pads are, and it’s very difficult to spread the solder paste around evenly with a cotton swab. After reflow, this second board turned out better than the first. There were fewer solder bridges, and the overall distribution of solder was more uniform. It was still far from acceptable, though. Now it’s time for a decision. Do I order a stencil, and try again? Out of pure stubbornness and a desire to see this finally work, I want to say yes. But the practical part of my brain says no, I’ve already proven that it’s faster to assemble these boards with my current technique of drag-soldering. That makes success or failure with reflow and a stencil irrelevant. Maybe I’ll try it anyway for “educational purposes” – a sure way to justify any questionable idea. I’m back with another episode of my DIY reflow soldering adventures! The first attempt using hot air didn’t go well, and the second attempt with a hot plate and half-inch thick aluminum block wasn’t great either. This time I used a lightweight disposable aluminum pie plate instead of the half-inch aluminum block. The idea was to reduce the thermal lag observed with the thicker block, and make it easier to remove the PCB from the hot plate after reflow was complete. The lightweight pie plate proved to be a bad idea. Its bottom was embossed with small ridges, and was slightly warped and dented. The pie plate wouldn’t sit flat on the burner, and the PCB wouldn’t sit flat on the pie plate. To make matters worse, the pie plate also deformed as it heated. With such poor thermal contact between the burner, pie plate, and PCB, the PCB heated very slowly and unevenly. It did eventually reflow successfully after 10 minutes of heating, but I had to push down one side of the PCB with tweezers to improve the thermal contact. The results of reflowing looked similar to my first reflow attempt using hot air: not good. There were solder bridges everywhere, but also clear evidence that many pads were dry, with only a portion of the pad area covered in solder. The photo above shows an example. The bare pads are ENIG plated and have a gold color. After reflow is finished it’s easy to see the areas that are still gold-colored, where solder never flowed. Ideally there should be no such areas. Such poor flowing of solder makes me think the flux in my solder paste has gone bad. A few days ago I discovered that my newly-purchased paste was already beyond its shelf life, so I’ve got more solder paste on order. Hopefully that will result in better solder flow, with pads that are completely covered in solder, and few or no solder bridges. My main goal with this whole reflow adventure is speed. I hope to assemble batches of a few dozen ROM-inator II PCBs faster than I can by drag-soldering with a standard iron. I can finish one PCB every 10 minutes with drag-soldering, and at least half of that time is consumed by fixing solder bridges. If I have to spend a similar amount of time fixing solder bridges on the reflowed PCBs as on the drag-soldered ones, then it’s unlikely reflow will provide the speed-up I’m looking for. Even if new solder paste resolves my solder bridge problems, I’m also concerned by the setup time required to dispense the solder paste and position the chips. I timed these steps, and they took 6 minutes, all before the reflow process even started. With practice I could probably speed that up by a minute or two, but that still puts the total time including reflow close to 10 minutes, even assuming everything goes perfectly with no solder bridges. Only by reflowing multiple PCBs at once could I hope to save any appreciable time vs drag-soldering. 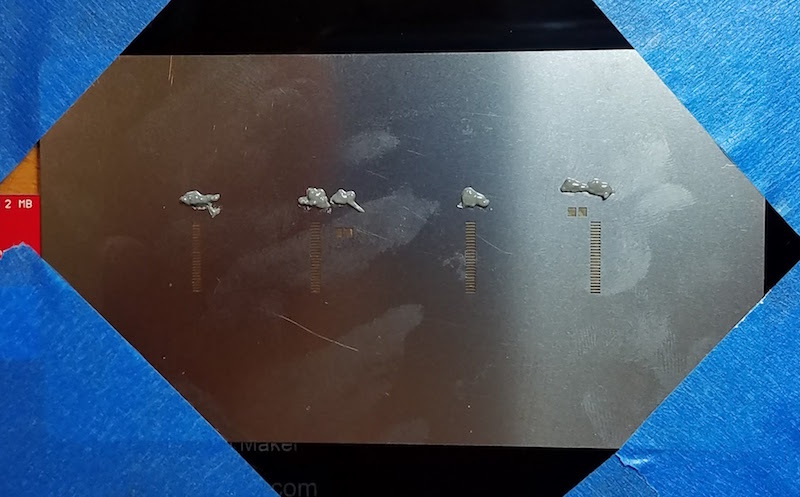 The video shows the entire process end to end, including dispensing the solder paste, placing the chips, reflow heating, and saying “woah” and “oh my gosh” about 20 times. I apologize for the poor quality of the video. My hand often blocks the view, and the camera isn’t positioned well to show the solder reflow in detail. Maybe you’ll find the “authentic amateur” style amusing! Last week’s attempt at reflow soldering with hot air didn’t go very well. Today I gave it another try with an electric hot plate, and it still didn’t go well, but maybe I learned something in the process. Will the third attempt bring success? My goal this time wasn’t really to solder anything important, but simply to test how quickly the hot plate heats up, and where on the control dial’s warm-low-medium-high scale will produce the necessary temperatures. I used an infrared thermometer to measure the surface temperature of the burner. With nothing on it, and the dial set to “medium”, the hot plate temperature increased by about 100 degrees Celsius per minute, reaching the 183 C melting point of solder after roughly 90 seconds. From there it kept on going to 300+ C before I aborted the test, so “medium” was clearly too hot. I later found a setting just above “warm” that produced a steady temperature about 150 C, which is about right for pre-soak. Unfortunately there was a large amount of temperature variation between different areas of the burner – about 45 deg C. This could cause problems form uneven heating if a PCB were placed directly on the burner. For my second test, I placed a 6 x 6 x 0.5 inch aluminum block on top of the burner, to use as a heat spreader. I put an old PCB on the aluminum block, with solder paste and a few small capacitors. It was quickly obvious that the aluminum block was far too thick for this purpose, with much too high a thermal inertia (what’s the right term for this?). Its temperature barely rose at all initially, but then it continued to climb for several minutes even after the hot plate was turned off, as heat was absorbed from the still-warm hot plate. When the aluminum and PCB reached about 100 C, I decided to turn the hot plate back on to “medium” and just let it rip. The temperature rose by about 15 deg/minute, which is pretty slow. Once it reached roughly 210 C and the solder paste was nice and melted, I turned off the hot plate, but the temperature kept going up! The hot plate burner was probably still at 300+ C, and the aluminum was still slowly absorbing heat. I had to slide the PCB off the aluminum while the solder was still molten in order to allow it to cool. Not good. The temperature variation between different areas of the aluminum was only about 5 deg C. But the temperature variation between different areas of the PCB sitting on the aluminum was as much as 90 deg C – yikes! 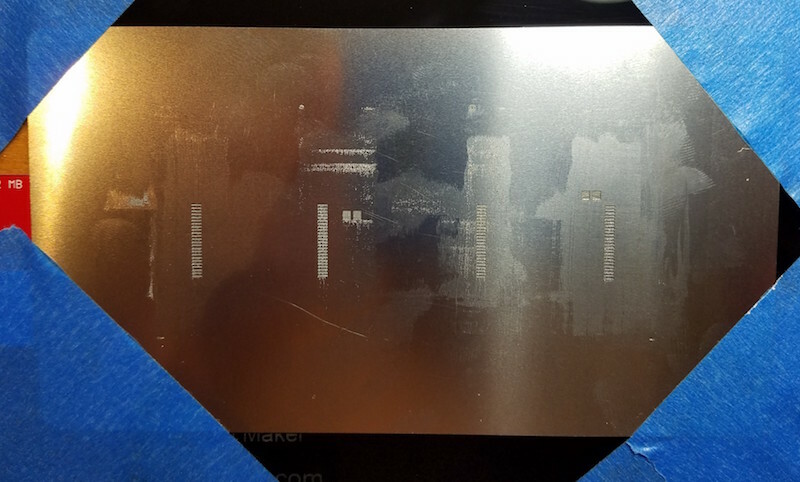 The test PCB was very slightly bowed, resulting in some areas not actually touching the aluminum, making them much colder than other areas just an inch away. I’m not sure how to fix that. Maybe I could press down on the PCB with a non-conductive tool while it’s cooking, but that would make it difficult to use the thermometer or adjust the control dial, and would make it almost impossible to reflow more than one board at a time. I was surprised to see how long it took the hot plate to cool off after use. More than an hour after finishing these tests, the aluminum block was still at 55 C. That could be a problem if I need to run several batches of PCBs through hot plate reflow. Will I need to wait 10, 20, 30+ minutes between batches, to allow the hot plate to cool? Maybe a reflow toaster would be easier than a reflow hot plate, but most of the advice I’ve heard says the opposite. I’m also very reluctant to use a toaster, since even a small toaster would be hard to fit in my work area, and it’s tough to see inside a toaster to observe what’s happening during reflow. I really like the open loop simplicity of the hot plate method, and would prefer not to mess around with toasters and thermocouples and temperature controllers unless there’s no alternative. If it comes to that, I might just give up on reflow and stick with hand soldering. For the next test, I’ll use a much thinner aluminum plate, or maybe just a couple of sheets of aluminum foil. I think the 100 deg/minute warming I observed without the aluminum block is actually about the right rate for reaching the pre-soak temperature, if I can find the necessary control setting to pause it there for a minute afterwards. But I probably still need something to help even out the hot spots on the hot plate burner, to ensure the PCB is warmed evenly.